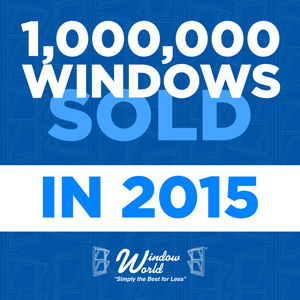 NORTH WILKESBORO, N.C., October 27, 2015 — Window World®, America’s largest replacement window and exterior remodeling company, proudly announced the sale of its 1,000,000th window for 2015 in early October. Although this is the seventh consecutive year Window World reached this sales milestone, the company has never attained the mark so early in a calendar year. This landmark is the latest in a number of sales achievements and industry accolades that Window World secured in 2015. The organization was ranked No. 1 Replacement Contractor in Remodeling magazine’s Top 550 for the seventh year in a row and named No. 1 Window Company in Qualified Remodeler’s annual Top 500 for the ninth consecutive year, all due to the hard work and dedication of its more than 200 locations nationwide. In addition, thanks to the integrity of the products and services it offers, Window World proudly announced its windows earned the Good Housekeeping Seal for the eighth year running.